This Demonstration shows a construction of a triangle given its circumradius , the difference of the base angles and that the circumcenter is on the incircle. Let be the inradius of . The Euler formula gives the distance between the circumcenter and the incenter. 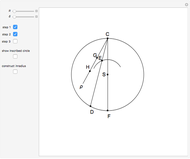 Since the circumcenter is on the incircle, , which has the positive solution . 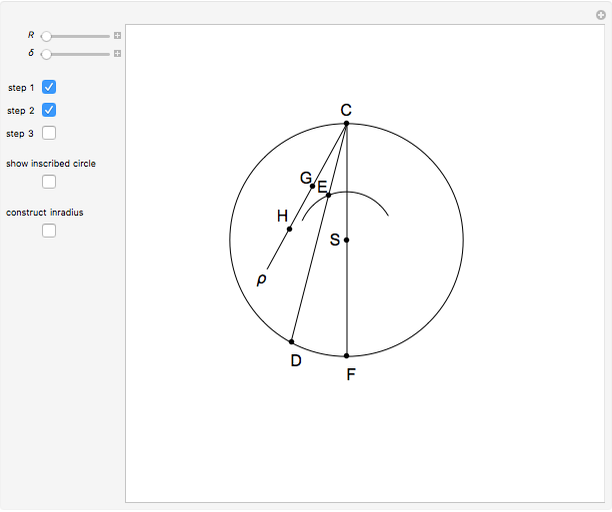 Draw a circle of radius with center and draw a diameter . Draw a chord at an angle from . 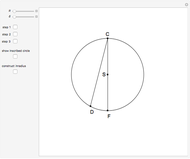 Step 1: Draw a circle with center and radius . Of the two points of intersection of and the segment , let the point be the one closest to . Step 2: Draw a ray from at an angle from . Let be the perpendicular projection of on . Measure out a point on at distance from . Step 3: The points and are the intersections of and the line through is perpendicular to . Proof of the last part: Let be on the angle bisector at , then . By construction and the theorem, and is the circumscribed circle of triangle with center and radius . By construction, is on the angle bisector at and the distance of to is . 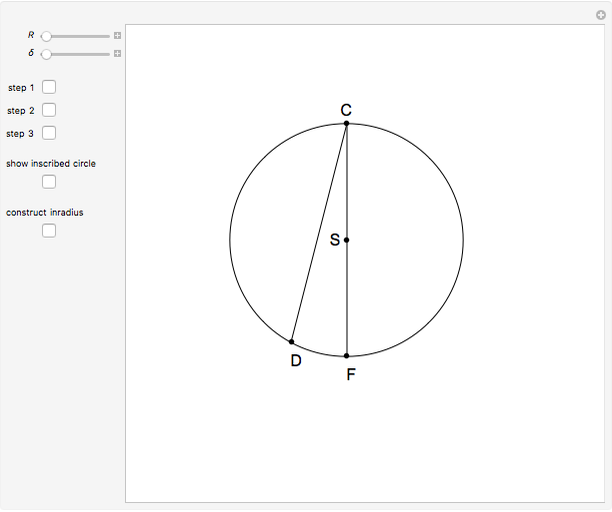 So the circle with center and radius is the incircle of , which by construction contains . D. S. Modic, Triangles, Constructions, Algebraic Solutions (in Slovenian), Ljubljana: Math Publishers, 2009 p. 83. Izidor Hafner "2. 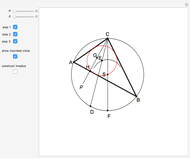 Construct a Triangle Given the Circumradius, the Difference of the Base Angles, with the Circumcenter on the Incircle"